LDH WORLD is a Global Entertainment and Creative Production Team. With LDH Japan as its centerpiece, LDH USA, LDH Asia, and LDH Europe will come together to form the 4 parts of LDH WORLD. LDH WORLD merges the creative minds of EXILE HIRO, VERBAL, NIGO, and Dr. Romanelli a.k.a DRx along with EXILE TRIBE's stage-production team, Team Genesis. 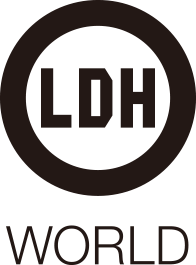 LDH WORLD will launch the handiwork of LDH artists and staff to the forefront of the entertainment world. Through the unity of artists, designers, musicians, and creators state-of-the-art technique and innovation will envigorate LDH. In recent years, LDH has experienced unparalleled growth. The new structure which we welcome here at LDH represents a new future; one which will light a path for the company into an innovative creative movement. As someone who began as a performer, I understand what it means to create entertainment and I am now able to maximize my creative vision to revolutionize the industry. The new structure to me is a way to reinvent myself, to speed up, and to take all that I have to the next level. The future of LDH seeks to achieve LDH members'dreams, and both staff and artists alike will come together and step forward onto the world stage. My goal is to leave behind a company which can inspire the world and continue to share world class performances and entertainment; this is the responsibility we have to our fans. LDH Japan along with our friends worldwide will create entertainment above and beyond your imagination. LDH WORLD will bring together Japanese and International talent to be "present" for fans around the world. Until now, the concept of bringing international talent into Japan seemed daunting. In the same way, sending Japanese artists into the world market brought forth its own challenges. LDH World will break through these barriers and bridge the gap by bringing together true visionaries in their field and foster an open-minded environment that nurtures and understands the value of an International Entertainment-Vision. To turn this vision into reality, LDH WORLD will replicate what LDH has achieved in Japan on the world stage. It is my dream to see this reality develop through our own creative platform. After meeting with EXILE HIRO in 2015, I was given the opportunity to join HONEST BOYZ, and work as the Art Director for the group Happiness. This was a turning point in my career and inspired me to create groundbreaking contents, surpassing my own expectations. With LDH WORLD I am ready to take things even further by utilizing my 25+ Years experience in the industry. Creating inspiring content is the key to entertainment success both in Japan and overseas. I got my start with LDH during the third generation of J SOUL BROTHERS III in 2015 as a costume producer. Then in Tokyo as well as LA we collaborated on the installation of the EXILE 15th anniversary - DR. ROMANELLI WALL ART EXHIBITION. I learned from these experiences the sheer energy and life behind LDH. I decided to stand with the team as part of what I believe to be a movement in entertainment. It was simply unbelievable to see tens of thousands of fans so enthusiastic to see the live performances of LDH. As LDH World's creative director my mission is to share this unbelievable moment I had with the world. I believe the way we will achieve this is to tell a story that will captivate the hearts of people on a global scale. I believe above all, brand collaborations will be our first step towards achieving this, on paper, somewhat lofty goal. There is no language barrier when it comes to dance. Dance has infinite possibilities when it comes to the stories that can be told through it. From the bottom of my heart – I cannot wait to see how these stories will unfold before the eyes of the world. Thank you very much.